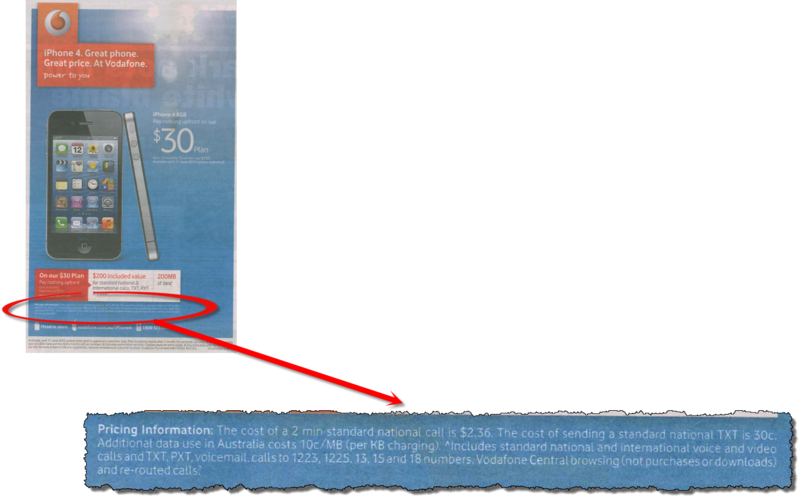 No doubt, Vodafone put in a huge TCP Code compliance effort. Very likely, it was fully compliant by the deadline of 1 April 2013. And yet within three weeks, it suffered a major compliance failure, when it published a badly deficient advertisement in a prominent newspaper. It just goes to show: compliance never sleeps. The message that compliance managers need to get across is that the 2012 TCP Code is not a ‘compliance crash diet’. 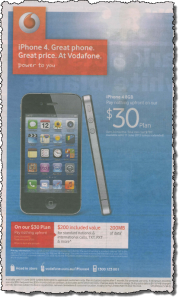 It’s meant to be a new way of running a telco business, a new reality for communications retailing in Australia. One consequence of that is that staff and contractors involved in marketing must factor Code compliance into their design and approval workflow. We’ll explain how to do that. Advertising compliance is not just about checklists and it’s not just about the big picture. It’s about both, working together. When we’re asked to legal an advertisement, we spend a few minutes just gazing at it. Staring. Reading a bit. Taking it in, in a pretty loose way. Getting the flavour. Letting the main message sink in. Seeing it as a whole. Then we go through our checklist for that kind of advertising. Without a checklist, trying to comply with the many laws and rules that apply to telco marketing is just gambling. 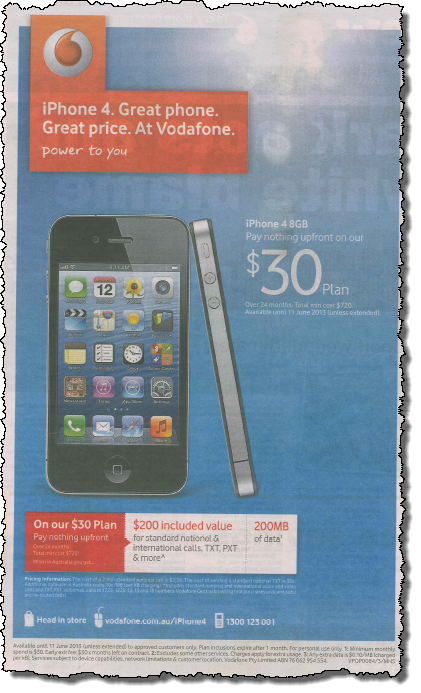 Why would we certainly have picked up the problem with the Voda ad? because one of our checklist items for print advertising is the obligation to prominently display the standard pricing figures. Then we return to the big picture. Sometimes there are fundamental issues that aren’t exposed by a checklist. Having soaked up the ad at first, and picked it apart with a checklist, we do an overall sanity check. In a difficult or particularly important case, we take a break before the last step. Sleep on it. Get some perspective. Effective compliance is systematic. It’s ingrained. It’s how you do business. Leaving out the unlikely possibility that Voda deliberately designed and published a dodgy ad, we can only assume that compliance with clause 4.2.6 of the TCP Code isn’t (or at least wasn’t) baked into its advertising design and approval process. Somebody who wasn’t alert to the rule gave the go ahead. Telcos need to re-engineer their business processes so that compliance with the TCP Code (and the law generally) is an assured outcome.